Steven and Peridot journey to the center of the Earth. Character development from Peridot! Also, confirmation that gem shards are alive and conscious, at least partially. "Just use the D pad" Oh Peridot. She is rapidly taking on the Slightly Annoyed New Recruit role, which is nice, because the other gems are too wrapped up in their personal quirks and roles to do that. She can remark on Pearl always crying and singing for the audience. And have things explained/explain them. Also I REALLY want to know what "feelings" she remembers from being created on Homeworld. That made her cry! Aw, poor Peridot. Plotwise: well that's probably the best possible idea for an 11-minute resolution, and nicely puts the "how will Steven heal corrupted/fractured gems" question on hold for now. But we know it WILL be answered, I'm guessing in the series finale. Peridot also confirms that shards/chunks/fusions "seek out" other Gems, which confirms what seemed to happen in Nightmare Hospital; the fusions were fairly docile until Steven showed up. I'm kind of bummed that the huge buildup of the cluster was resolved so quickly, but I'm happy the slate is wiped clean to focus on Peridot as Junior CG as well as maybe finally getting some episodes to explore Lapis' character. Good hinting at Steven's destiny to restore the shattered/corrupted gems. Steven's really showing some telepathic/astral projection chops lately, what with Chille Tid and his watermelon possession power. Really curious to see if he can make contact with a corrupted gem. Time to revisit Centipeedle? In retrospect it should not be surprising that Steven resolved the Cluster situation (for now) via understanding, kindness, open-mindedness, and empathy. I'm just so glad the show is back! I've been saying this everywhere: "wow thanks" is the new "as you wish". I hope you say it with an inappropriate amount of aggression. "WOW! THANKS!" Can anyone read the control panel? Nevermind, I guess the wiki answers most of that. "BL PAC" though? All of those non-pod, non-drillhead parts, including Russian ones, came from the barn. Plus the parts that got used for Pearl and Peridot's robots. Plus the parts for most of a spaceship that Pearl built. What the heck were Greg's aunt and uncle up to in there?? The cluster isn't really resolved though, is it? It's still down there, in a huge bubble. Now it doesn't want to form and destroy the Earth, but if something pops it, it still can't bubble itself without help. I am left wondering, though, what would happen if one of the Gems did their little "boop" move and warped the Cluster bubble back to the temple. Also, in the past it's been shown that the gems' bubbles each have different properties, with Steven's bubbles being considered close-enough to Rose's to pass on sight (see Secret Team). What effect might that have on the Cluster? Greg's aunt and uncle are the most mysterious human characters alluded to on the show to date. I hope we find out more about them soon! I might have gotten some of the letters wrong. I'm so excited for new episodes! And these past two are just wonderful. I guess resolved = put on back burner, really. It seems like the next logical progression of the plot is for Yellow Diamond to come to earth herself to pop its bubble and finish the job. And Steven's narrative heads toward him figuring out how heal a shattered/corrupted gem. As an aside, given how gems view fusion as taboo/a cheap battle tactic I can't imagine your average homeworld gem would look on the production of a vast gem cluster any more fondly than a human would on some equal body horror creepiness. It was Peridot's job to check its progress, so I can imagine she and the other members of that expedition were briefed on its existence, but I doubt the rest of the gemkind knows. Would they be suitably horrified by the gem cluster? Or would the knowledge that it was made by the totally flawless and perfect Yellow Diamond be sufficient for the populace. OK, since the resolution of the cluster thing is to kick the can down the road, I'm going to completely spitball a potential resolution: somehow Steven is going to distribute the shards to every single person on earth, which means that people who are really close can form spontaneous (if short-lived) fusions. It seems like the next logical progression of the plot is for Yellow Diamond to come to earth herself to pop its bubble and finish the job. Well, Jasper was given a nice volcanic burial, and may be able to reach the cluster as well. Do we know airdates for upcoming episodes? 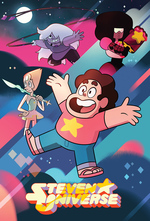 The next three are on the next three Thursdays, after that it's uncertain, but Cartoon Network has been making noises concerning a "Summer of Steven," so keep your fingers crossed!